Real estate listings and search site Zillow,</a is launching an Android app to allows users to search its 95 million listings on the go. The startup has seen considerable success with its iPhone app, which launched in April of last year and has seen 1 million downloads with more than 2 million homes viewed each month on the app. The Android app is expected to hit the Android Market by tomorrow. Zillow’s Android app has similar functionality to the iPhone app. 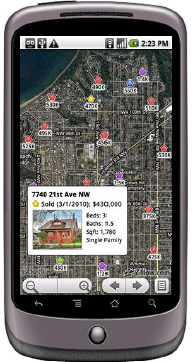 The Android app uses GPS technology to find and follow users on an aerial map, and displays values, homes for sale, homes for rent, listings and recently-sold data on the homes around their local area. Users can also search for homes, even if they’re not nearby, utilizing the Android’s voice search capabilities. You speak the address, neighborhood, zip code or city into the phone and the app will instantly take the user to the location on the map. And the app leverages Google Street View by displaying curbside images of homes and streets. Each listing features the same details as the listing on the web, with multiple photos, home details, and contact information on homes for sale or for rent. Users can also filter their home searches by sale price, rental price, number of bedrooms and bathrooms and listing type (for sale, for rent, and recently sold). Zillow, which launched as a mortgage marketplace in 2008, recently added rentals to its business, opening up the site to a new market in the wake of the burst of the real estate bubble. Zillow is also hoping to IPO in 2011 and according to reports, is currently courting Wall Street investors.